Whether you have explored many of Tucson’s beautiful outdoor spaces, or you are a beginner when it comes to hiking and exploring, there is so much to see and do in Tucson that knowing which parks and trails to visit can be a big decision. Even if you are not into exploring the trails, activities such as bird watching, still allows you to get out and enjoy the wide open spaces. If you have never visited Seven Falls Tucson, then now is the time to get out and explore this beautiful space. No matter what time of year it is, Seven Falls offers residents and visitors of Tucson, miles of trails and hours of outdoor exploring. Located in Sabino Canyon in the Santa Catalina Mountains, Seven Falls is in fact just one waterfall, however there are seven stream crossings along the trail. Whether you choose to spend a few hours hiking or you decide skip most of the hike and take a tram, Seven Falls Tucson is well worth a visit. This area is filled with history and the Sabino Canyon that you travel along to get to the falls is said to be created by an earthquake that centered in the north Mexico area in 1887. This earthquake causes boulders to dislodge and you can still see those boulders lining the canyon walls. The forest service created in 1905, took over the care of this area, and working with the Works Progress Administration and Conservation Corporation, the bridges and dam were built, this occurred during the Great Depression Era. In 1978 trams began to operate in Sabino Canyon and cars were no longer allowed. Since then you can only access the area, including the Seven Falls, by foot, bike, or tram. With so many beautiful vistas to see in the area it is sometimes easy to miss the birds and critters that live throughout this area. There are many smaller creatures that skitter through trees and leaves as well as many beautiful bird species. Here are some you may want to be on the lookout for. Collared Peccaries – Emitting a musty odor, you may smell this little guy before you get to actually see him. These smaller pig looking animals are usually found traveling in herds. White Tail Deer – With their white bottoms and big mule like ears, it is amazing that these deer camouflage into the scenery so well. Snakes – Many snakes live in the Canyon and Seven Falls area, from harmless garter snakes found in the damper areas, to the more dangerous rattlesnake which tends to enjoy the desert scrub. Birds – There are many species of birds throughout the area including Road Runners,Vermilion Flycatchers, Cactus Wrens, Ruby Crowned Kinglets, and several species of Hummingbirds. Bird Watchers will find that with each season the bird population changes, making year round viewing a must do. If you are looking to visit the Seven Falls and surrounding area, there are three main trail heads that hikers tend to start from. Two of these trailheads, Sabino Canyon trail, and Bear Canyon trail, both begin at the Sabino Canyon Recreation Area. 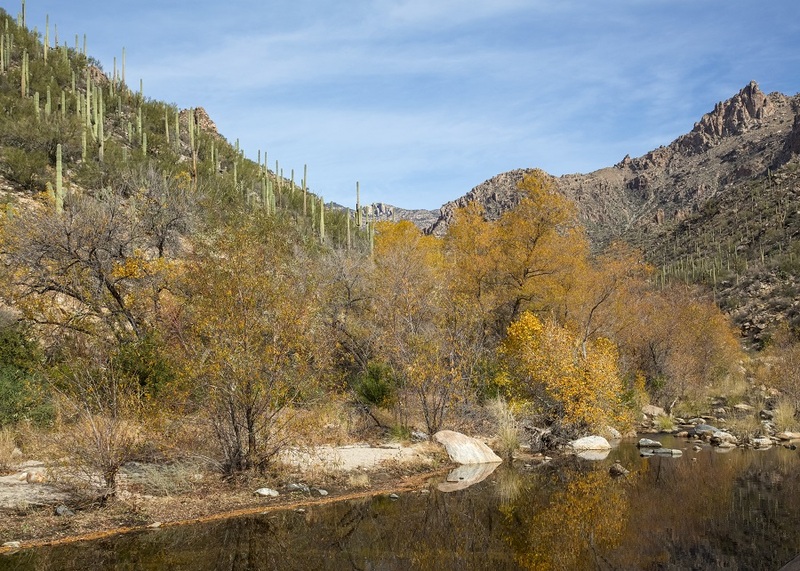 Sabino Canyon requires a day pass which costs $5 and can be purchased at the Recreation Area. If you are looking to take the Tram, Tram Tours are run by Sabino Canyon Tours, rates start at $8 and vary in distance and time. If you are looking for amazing scenery, wildlife viewing, and outdoor adventure, Seven Falls Tucson is well worth the visit.